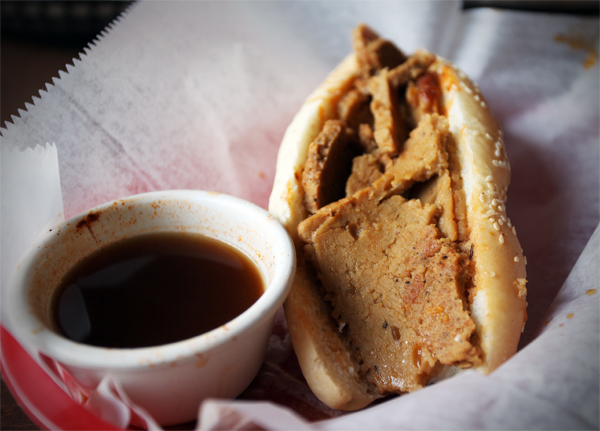 served on a sesame seed bun slathered in vegan aioli, it’s stuffed with thinly sliced strips of seitan and served with an au jus dipping sauce. i have no idea if it will still be available by the time you read this post…but trust me: if you ever see the vegan french dip at tony’s, give it a shot. the thinly sliced wheat meat is exceptional—hopefully some day it will be a regular menu item. i forget the exact amount this dip set me back, but i think it was reasonably priced at around 8 bucks (as most tony’s specials tend to be). go get this sandwich, and wash it down with one of the 30-something california beers on draught. you can thank me later! I’ll thank you right now!! Thank you!! I’m gonna head over the next time they offer this special and enjoy!! Whoooohoooo!! Love all of their vegan food!! Mmmm! Thanks for the heads up! I have eaten this sandwich and can confirm it’s one of the best in town. Oh, my god. That looks incredible! The vegan French Dip is pretty good, but the best vegan special Tony’s has had is the Punjabi Po’ Boy, which I haven’t seen there in a while. The Wheatloaf Sliders are excellent (and also the most moist of their sandwiches). Unfortunately, I thought the Marinara Meatball Sub was really bad. Plus one on the meatball sub! I hated it. Good sauce, but the meat was weird.